The Traffic Injury Prevention Journal recently released a study comparing traffic accidents involving novice teen drivers and experienced adults. The study uses data from the Strategic Highway Research Program 2 (SHRP2) Naturalistic Driving Study. Naturalistic driving is a new approach of analyzing driving behavior. In the SHRP2 naturalistic driving study, 2,360 drivers of all ages and genders across the US agreed to have their driving behavior electronically monitored. For a specific period of time, each participant’s car was equipped with high tech data-collecting devices that analyzed their day to day driving activities and behavior. A team led by researchers from the Center for Injury Research and Prevention at the Children’s Hospital of Philadelphia used the naturalistic driving data to compare crash rates and rear-end striking crashes among novice teens and experienced adults. Researchers found 539 crashes involving novice teen drivers (16 to 19 years old) or experienced adult drivers (35 to 54 years old). They looked at data from onboard instrumentation such as scene cameras, accelerometers and GPS to identify rear-end crashes. Each of these rear-end collisions were then analyzed to obtain information about impact velocity and severity of the crash. The study found that rear-end crashes represented 43% of all significant at-fault crashes. Novice teen drivers had a crash rate of 30 per million miles driven and a rear-end striking crash rate of 13.5 compared to respectively 5.3 and 1.8 per million miles driven for experienced adult drivers. The median impact velocity for rear-end crashes was 18.9 mph for novice drivers and 2.8 mph for experienced drivers. 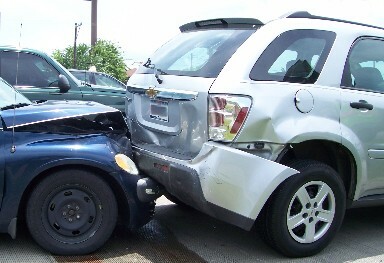 Rear-end crash severity was also higher for teens than for adults.